"Like Dracula's evil castle, on its day off"
Arthur dares to change his life for the better, in a town full of ugly souls and grotesque individuals. In Theatrica City, you can be whatever you want to be, do whatever you want to do, and even live for as long as you choose. But you have to be ready to do whatever it takes. And Arthur is very, very determined. A crossover novel, incorporating general fiction, sci-fi, the fantastic, horror and suspense, drama and comedy. Inspired by the likes of Mervyn Peake, Dickens and Russell T Davies. I love ‘quirky and different’, and from what’s evident so far I do believe this novel could be quite exciting. The opening chapters depict a blunt realistic world in which the various weird and deranged characters’ reactions are combined with recognisable everyday elements, but wrapped in an edgy tense and surreal atmosphere. 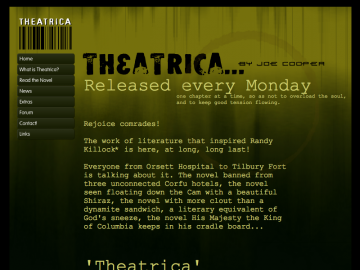 Theatrica has not been recommended yet.